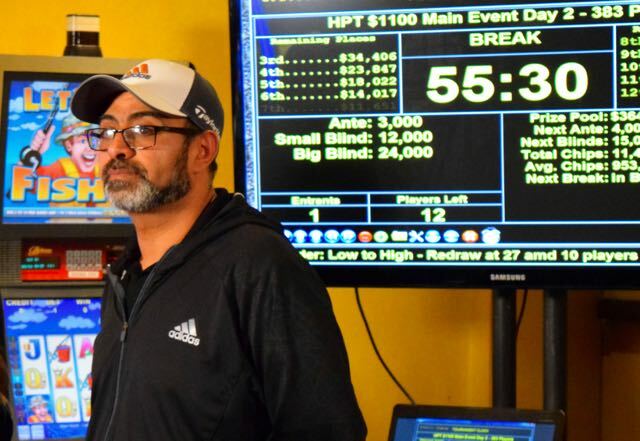 A LOUD yell from @HPTPoker @BBelterra Table 11 comes from Sameer Al-Dbhani as the table's two monster stacks - Al-Dbhani and Jesse McEuen smash into one another, getting all the chips in preflop in what looks to be close to a 4,000,000 pot. is The flop 6♦️ J♥️ 5♥️ and Al-Dbhani yells out again, calling for a deuce. There's a 3♠️ turn an 9♣️ river, and a third cheer from Al-Dbhani. After this third cheer, McEuen - who had become the BigStack in a major clash with Ben Beighle an orbit earlier - has heard enough and he begins chirping at the new chipleader. The players chirp back and forth at one another as the dealer counts out A-Dbhani's stack at 1,876,000, and the words escalate to yelling by both once the chips are gone from McEuen - leaving him with about 500k. A quick string of obscenities comes from McEuen as he exits the tournament area and heads off on his 60-minute dinner break.